When your pet starts losing hair in localized spots it is important to determine the cause so that you can begin the proper treatment. This is a guide about remedies for cat losing hair. My cat is 2 and has been losing hair since I got her fixed. She is an inside cat and every time I touch her she moves or bites me. Does anyone know why she could be losing hair on the inside of her legs, belly, and a little on the front paws? It could be a hormone imbalance. Many years ago, we had a cat that was spayed too early, and she then suffered from eczema. She needed a daily dose of Ovarid. You should check with a vet. Sounds like an hormone imbalance. My vet once told me my cat had a hormone imbalance and I said, "Great, does that mean she has to be on a hormones for the rest of her life". No, one big pill did the trick. Then she was fine. Cats who lick excessively (barbering) ultimately end up removing hair and it may appear to be falling out. Barbering is usually an indication of an itch which may be the result of allergies or in the case of recent surgery may become habit as the incision heals and causes itching discomfort. A trip to the vet after some careful observation will relieve kittie's discomfort and eliminate the need to lick to excess. My 4 month old kitten has 2 missing patches of fur and they bleed. I've been using peroxide to help heal it, but I don't know what is going on with her. Last week she appeared with the first patch and it's long and hard. Today when I came home from work she had another patch, so I put peroxide on them once again. 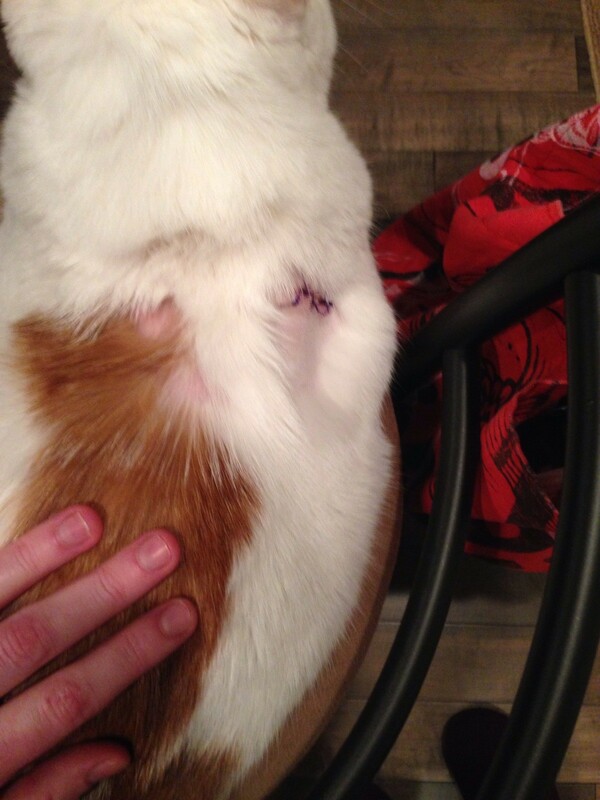 I want to know what could maybe be the causes of this or how to heal it without expensive vet bills. These patches just keep coming out of nowhere and I just don't know what to do. The only thing I can really think of is maybe it is because I got another kitten that's only a week apart from her and he's a boy. You can tell they really love each other and they are always playing and fighting together, but their fighting never looks that serious so idk what it could be. Try coconut oil. It come in a jar, $4.99 at aladis or any grocery store. Warm the coconut oil and apply it the the cat's fur. I apply this oil on my cat on all the areas where her fur is coming out. At first, I apply it pretty much all over her. That helped a great deal as she has skin issues and an allergy. Coconut oil, it works wonders! Have a pet who lost all her coat because of a flea allergy. Most of her coat has been restored except for a spot on her neck. What can I do to restore that bald spot? Whenever my cat lost his fur, it seemed to grow back the following season. Cats get a lighter coat in spring/summer and a heavier coat in fall/winter. The fur might start growing, but would fill out the following season to the point where it wouldn't be noticable. My 4 1/2 year old cat lost hair when I applied flea treatment. Is it normal for some cats to lose hair after a flea treatment? His hair fell out the next day after the treatment. There is no redness and his hair is growing back. Is it safe to give him another treatment when it is due? I bought the flea treatment at the SPCA. It is not at all uncommon for cats to lose hair at the site of administration of flea preventative medication. I work at an animal hospital, and we get this question regularly. However, you'll want to go ahead and call your regular veterinarian to let him/her know of this so that it may be notated in your cat's medical chart. Hair sometimes grows back, sometimes not. Keep an eye on it and let your vet know immediately if you notice any redness or irritation. My cat is 8 and spayed. She started to lose hair on her elbows and I thought she'd scraped it off somehow. I took her to the vet and after he said it was just flea allergies or her food I had him run all their tests and $350 later he said the same thing since all the skin tests and blood tests, etc. were normal. I changed her food, but she continues to pull on at spots, mainly her side and back. None of my other animals have any of this. I'd go to another vet, but it seems a cat expert is needed. Does anyone have anything you've tried and worked. I thought maybe hormones or a fungus, but have tried all sorts of things. I use the anti-itch stuff from Petco and then she's fine, but she hates being sprayed three or four times a week. Thank you to anyone who has the solution. It could be anything, esp when it comes to the skin. Could be allergies to something kitty is eating, allergies to something he/she is sleeping on, fungal etc type infection or actually stress. Some pets when they are stressed will chew, bite, rip etc at their fur/skin. Tests came out negative so odds are not some sort of infection. Definitely change the food again to see if there is a difference, also try to think back when it actually started and what did YOU change with your kitty which could be the culprit, even laundry detergent. kitty litter etc... if it stress related what has changed in your home? A new pet, a boyfriend, more people visiting then usual etc you get the idea. I do suggest bringing your kitty to another vet as well. I have 2 indoor cats and just recently moved twice in 2 months. They are both treated with Revolution. My 1 1/2 year old boy is licking the hair off his front arm and starting on the second going up his shoulder. He had fleas before, but I used Revolution and I don't see any fleas or flea dirt. I don't know what is wrong. He has a good food and no chicken. The older cat is 14 and she doesn't want to play. He tries, so could it be he's bored? Please help. Any help for the flea prevention, and over grooming and any ideas on how to help with his nervousness, and any home remedies for any of these problems would be very appreciated. So if anybody can help with what I can put on his arms where he's over groomed, in a few spots he's almost at the skin like a buzz cut. Can I put anything on it to help with the itch or if it's hot. If there is anything natural, a home remedy? I too have an older cat, 13 yrs, he had been over grooming and had eaten all the hair off his belly, rear end, and outer legs/hips area. He also had some small sores on his neck, which I thought was from the younger cat biting him when they would play, turns out I think it was from him scratching all the time, you could tell he was itchy from all the scratching. I thought it was just stress since we had gotten a younger cat and he chases the older one around all the time. I started finding small white seed like things where he would lay. These turned out to be dried tapeworm segments. I took them both to the vet and both were given a shot for the tapeworm. My older cat got a steroid shot and an antibiotic shot for the itching and sores on his neck, which they shaved and cleaned well. Within two days he was doing much better. The over grooming has stopped and his hair is even starting to grow back. The vet said that he had the "classic" allergic reaction to flea spit, even though they hadn't had any flea problems for months. Take your cat to the vet for a steroid shot, that will stop the itching/scratching. good luck. My cat, who is about 8 years old, has hair loss on the inner thighs, and going all the way up. I've noticed on my bathroom sink there are spots of blood from her. Sometimes it looks like scabs with hair in them. She's never had allergies before. This happens to my cat when she gets fleas from the dog. Apparently she is very sensitive, or even allergic, to fleas. She loses hair on her legs and belly and starts to act very twitchy and paranoid. I would check her for "flea dirt" and see what you find. Definitely sounds like an allergy. It could be to fleas or her food. My cat went through the exact same thing. I switched his food and give him flea medicine and he's much better. It's taken 6 weeks and his hair in not fully grown back in, but it is much better. He doesn't scratch as much now. Good luck. I'd definitely take your cat to see the vet. 2 of my cats just had kittens, 4 weeks apart. This is the 3rd litter for 1 cat, and the 1st litter for the other. My 1st time mama was a smaller thin cat and started losing fur around the joints of her legs. Since the birth of her 4 babies, she has lost more fur on her legs and under her tail right by her rear end. I had her to the vet about 6 months ago and everything checked out. Could this be because she is a 1st time mama and she seems a little stressed out? Neither of my female cats nor the male have ever been outside. This sounds like a nutritional deficiency to me. When cats make milk, almost all the nutrition they take in goes to that milk to feed the kittens. If your cat was thin in the first place, then she wasn't in good enough condition to get pregnant and now she is ill. Try to correct it by feeding her a much higher nutrition food. My cat has lost fur in one long straight strip on his back. He is 6. Can anyone help? Your cat may have an infection, scabies, mites, etc., that can cause hair loss. Please take him to your vet for help as these problems usually worsen without treatment and your cat suffers. My 7 year old cat had a cyst removed on his right shoulder blade last Wednesday. The next day I noticed he was shedding a lot and there was a patch of fur gone! Now today I've noticed another bald patch. They're both on the left shoulder blade. Any ideas? I've been giving him tramadol for a pain reliever here and there. Feline endocrine alopecia: Thinning or balding of the coat on insides of the back legs, lower abdomen, and genital area. Distribution is symmetrical. Occurs most often in neutered males and spayed females. I have a 1 year old female cat who very recently started losing hair on her ears, back of head and neck, and down almost to her shoulder blades in some spots. It's pretty uniform across her ears and back of head and then when it gets lower it's just in spots. I thought it could be because I'd gotten a new collar, but I took it off and she's still losing hair. We did just get a new pet, but since we got her we've added 8 other pets and she's never had a reaction like this. No changes in behavior. The only significant change has been the addition of wet food to her and our other cat's dry food once a day. They split one of the small cans between the two of them. Since I started doing that she has gained some weight and it's been since then that she started losing the hair. Is it possible that she's having allergies to wet food that she didn't have to dry only? Anything is possible but if you have not taken your kitty to your vet for help for her hair loss, you do not know the actual problem and she will continue to suffer!!! The hair loss could be from mange, fleas, mites, an allergy, a skin disease etc. Her condition might also be contagious to your other pets. As she continues to have problems, please take her to your vet now for a correct diagnosis and treatment. She has already suffered for some time from the unknown problem and will continue to suffer until you take responsible action and take her to your vet for help. My cat is losing a lot of his hair in patches all over his body and losing weight and has scabs. It mostly happens in the summer. What could this be and how can I stop it from happening? 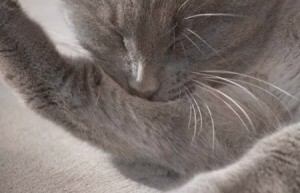 Your kitty may have mange, mites, and many other possibilities. 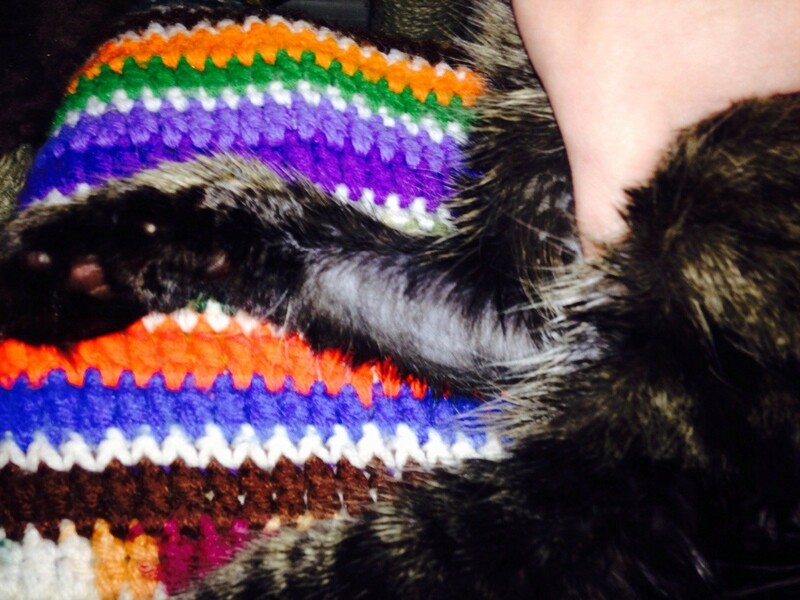 Please take kitty to a vet immediately as the scabs indicate irritation, scratching, possible infections, etc. Your cat needs help to stop the irritation and discomfort, as well as restoring the body hair. I have a 1 year cat, Kendell. On the back of her neck right between the shoulders she's got a patch of fur gone. Now it's all red from it bothering her. I only noticed it right around the first time she went into heat for first time. I have no income so I can't go to a vet:( Is there something at home I can do? Please anyone help! Thank you. 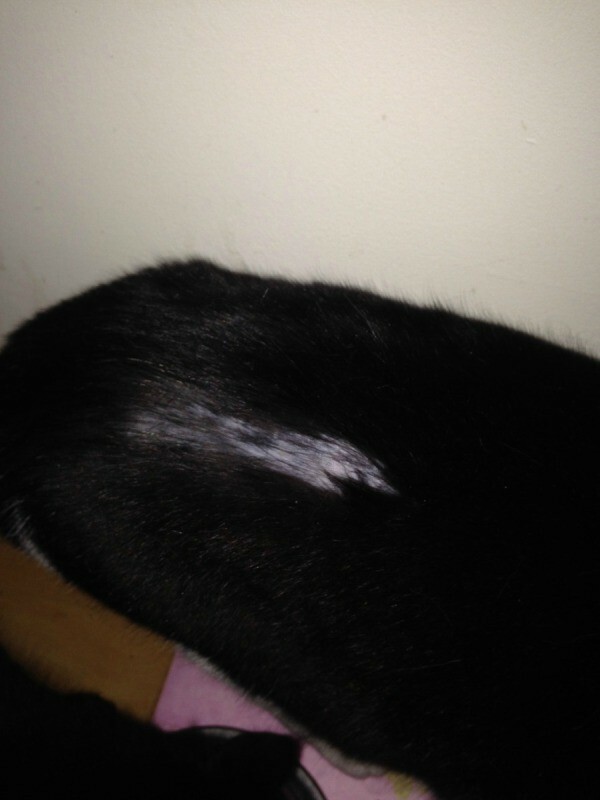 This is a common problem with spot on flea treatments. If you have had her awhile and have not used flea treatments, it is most likely something else. Only a Vet can really tell you when he examines your cat. But you have a bigger problem than a cat with a suspicious spot. You really can't own a pet without the ability to pay for their medical care. It is heartbreaking to love a pet and not be able to help them when they are sick. And it is certainly not fair to the pet. Perhaps you can find a part time job (gardening, house cleaning, babybsitting) to build a fund that will protect your pet. If not, you can surrender your pet to a no kill shelter to be treated and rehomed. You sound like a caring person, and you do not want to be in a situation where you cat is very sick, and suffering and you can't do anything about it. Good luck to you. And get your cat spayed asap or you troubles will soon multiply. My cat is licking and biting on his back near his tail. His lovely mane is disappearing too. I have a rescue cat who has terrible dandruff. He sheds so much more than the other rescue cat I have. He leaves tremendous amounts of dandruff and hair wherever he goes. Brushing makes it worse (so the vet tells me). I need to know how to help this guy. He makes just sitting with him uncomfortable, stroking is out of the question as he leaves so much hair and dandruff. I know cats shed, but this is beyond the pale. He really needs the love and attention of sitting in someone's lap and being stroked. It's just too unpleasant due to his dandruff. Does anyone have any ideas? I have three cats, and one is an extreme shedder. I think some are just that way. You know Pigpen from the Peanuts cartoons? I compare her to him. Anywhere she goes, she leaves hair. It seems like you look at her, and her hair gets on you. I wonder why your vet said that brushing makes it worse. I was talking to our vet about it, and she showed me a Furminator brush/comb. It's *really* effective. And Lizzie (the cat) loves it! When I'm going to brush her, I get a towel and spread it out on me first, then Liz hops up and I brush away. Afterwards there is enough hair for a kitten! I don't use it too often, though, because I've read that it can be overdone (I read about someone who was not paying attention, brushing her cat's hair while on the phone, and made a bald spot). Using the Furmitator on her every now and then seems to help with her shedding a little bit, although she still sheds more than the other two cats. But if the vet says that brushing is a no-no, I guess you shouldn't do that. Did you discuss the cat's diet? I know diet can affect the skin/coat. You can do like me and spread a towel out when petting him, to help keep most of the fur/dandruff off of you. I have to go wash my hands after loving on Lizzie, and sometimes I have to change my shirt before cooking. I pay my daughter a dollar to clean our furniture with the Scotch Fur Fighter once a week. We've just learned to deal with it. I'm glad that you're helping these cats. I hope you find a solution that works for you. Good luck! It's possible your new rescue cat has a vitamin deficiency. Also, I read on the 'net that you could use "Olive Oil" (only) in drinking water daily and it helps condition the skin/fur in canines. Maybe in a few months you will see a difference. Just do a google search to find out how much olive oil to use in the water dish although cats don't drink as much water as a dog would. I wonder why the vet hasn't diagnosed the cat's condition and begun some time of treatment for it. I have a cat that I love but had terrible dander that made me sneeze. I change her food to a different brand and it has gone away. Maybe he is allergic to corn or something in the food? food/environmental allergies. At one point shortly after vaccinations and healing from her spaying operation, she developed a UTI. Her feline specialist vet recommended a diet change from grocery store brands of kibble and soft food to Purina One urinary support. And I was told to find a minimal ingredients, grain free wet food. Her UTI went away, however she began to develop a bump just on the inner rim of her ear and her sister developed an ear infection after the gradual diet change. After another costly trip to the vet I was told to take both kitties off of the PO urinary support and we did the gradual diet switch again to Canaday pure grain free kibble and the same brand canned food along with Natural Balance and Pride by Instincts wet food. As we have two kitties with different pallets. My kitty Bubbles, although tested and treated with prescribed medicine, never fully recovered from what was diagnosed as an allergic or fungal ear infection. Now, my sweet BB is licking the fur off her front legs. Both kittes rub their mouths vigorously on corners. Sometimes it seems too tough, like they are trying to scratch a serious itch. Otherwise they both seem happy and healthy. My biggest concern about these issues is that the house we currently live in (and are trying to get out of as it has made me sick with allergies and severe sinus infection and headaches, fatigue) has a leaky roof and mold. The porch leaks moldy water on the floor. I groom them daily since the mold water began to drip. I give them the big lick, which is just a vigorous wipe down with a tablespoon of ACV and warm water. I am also putting coconut oil on BB to help with her legs which I have discovered that around the perimeter of the bald spots, is a little dry and scabby. If anyone has advice besides going back to the vet; who only seems run tests and come to no firm conclusion yet prescribes meds that cost a ton and in the long run, don't even help my babies. I've literally spent thousands trying to get to the bottom of these symptoms the girls experience. Thank you all in advance!